The number of people with graduate degrees — master's degrees and doctorates — who have had to apply for food stamps, unemployment or other assistance more than tripled between 2007 and 2010. With the economic troubles of the past few years, it's no surprise that the number of people using food stamps is soaring. The U.S. Department of Agriculture reports that an average of 44 million people were on food assistance last year; that's up from 17 million in 2000. What might be surprising, though, is one subgroup that's taken a particularly hard hit. The number of people with graduate degrees — master's degrees and doctorates — who have had to apply for food stamps, unemployment or other assistance more than tripled between 2007 and 2010, according to a report in The Chronicle of Higher Education. In 2010, the report says, 360,000 of the 22 million Americans with graduate degrees received some kind of public assistance. Chronicle reporter Stacey Patton spoke with Tell Me More host Michel Martin about why so many highly educated Americans have to rely on this type of aid. One thing that is happening at universities, Patton says, is the overlap between graduate students and adjunct professors — "contingent" faculty who are working on contracts. In an effort to cut costs, she says, universities increasingly rely on these instructors because unlike tenured faculty, they work part time, they don't have health benefits, and they can be fired or not have their contracts renewed. "What we continue to do in graduate schools is encourage people to take master's degrees and Ph.D.s [to fill those positions]," Patton says. "But the economy has taken such a hit, and so has higher education, so they do their work and come out and don't have opportunities for jobs." Many states have had to cut their higher education budgets, and Patton says universities defend their use of contingent faculty instead of hiring full-time faculty as a necessary way to cope. Tony Yang received his Ph.D. in history from the University of California, Riverside in 2009. Since then, he's worked on and off as a history lecturer, but has had to depend on unemployment and food stamps to get by. "One of the bravest things to do is to graduate into [the recession]," Yang tells NPR's Martin. "It's an incredibly difficult job market, and you're constantly hustling to try and get another job." In his best year since getting his Ph.D., Yang says he made about $32,000; in his worst, about $10,000. He says there's a perception that if you have a doctorate, you automatically walk into a high-paying job. "I have the prestige of holding a Ph.D., but that [isn't] paying the bills," he says. While reporting her story, Patton says she heard a number of stories similar to Yang's, but many of those folks didn't want to go on the record for fear of shame. "You go to graduate school, you get a master's degree [or] you get a Ph.D., it's a hard thing to embrace that you're also now on welfare," she says. Though only a little more than 1 percent of graduate-degree holders are on government assistance, Patton says what worries her is that the number tripled in just three years. "One has to wonder, is this trend going to continue to increase?" she says. I'm Michel Martin, and this is TELL ME MORE from NPR News. Coming up: Teenagers are getting ready for the summer but for many of them, it is not all sun and fun. There have been gloomy numbers on the jobs front, so we're going to speak with Hilda Solis. She is the secretary of Labor, and she will tell us about how the administration is trying to help more teens get that coveted summer job. But first, we go to the other end of the education spectrum, where you think those job concerns might not be a big issue. Now, we've talked on this program a number of times about how more Americans have been relying on food stamps and unemployment benefits to get by, But you might be surprised to learn - as we were, frankly - about one group that has taken a particularly hard hit. The number of people with Ph.D.s who have had to apply for food stamps or other government assistance, like unemployment, more than tripled between 2007 and 2010, according to a recent study. The Chronicle of Higher Education recently reported on this, and we wanted to know more. So we've called upon staff reporter Stacey Patton. Also with us is Tony Yang. He received his Ph.D. from the University of California-Riverside three years ago. He's worked off and on as a history lecturer since then, but he has also relied on unemployment benefits and food stamps to get by. I welcome you both. Thank you both so much for speaking with us. STACEY PATTON: Thank you, Michel. MARTIN: Stacey Patton, let me start with you. Why are people with doctorates getting hit so hard? PATTON: Well, I guess there's a bit of back story to answer your question. When I started covering graduate students for the Chronicle, I noticed that there's a lot of overlap between graduate students and adjuncts. These are contingent faculty who are working on contracts. And there's been a major shift in the past 30 years in universities' reliance on contingent faculty. They work part time; they don't have health benefits; they can be fired, or not have their contracts renewed. And so it's a much cheaper way - it's a cost-cutting measure for many universities. But what we continue to do in graduate schools is to encourage people to get master's degrees and Ph.D.s. And the economy has taken such a hit -and so has higher ed, has taken such a hit - that they do their work and then come out and not have, you know, opportunities for jobs. MARTIN: Well, let's bring professor Yang in here, because he's kind of a real world example of exactly what you're talking about. Professor Yang, you graduated in 2009. And you told Stacey that the first thing you did was file for unemployment; and that for the past three years, you have worked. But as I understand it, you've never been able to put enough hours together to earn a living wage. Does that about sum it up? YANG: That about sums it up. I think one of the bravest things to do is to try to graduate into the Great Recession. But it's an extremely difficult job market, and you're always constantly hustling to try to get another job or an appointment. And you don't turn them down, even though you probably should. And it's an experience, I think, a lot of us have shared - those of us who are just coming out onto the job market right now, particularly in higher education. MARTIN: At your peak, your best year of earnings - do you mind if I ask - what was it? YANG: It was about $32,000. MARTIN: Thirty-two thousand in your best year. What about your worst? MARTIN: So you were making as much as a nanny, basically. MARTIN: A full-time nanny in an urban area. MARTIN: Who's actually making what they're supposed to make, you know. Yeah. YANG: You know, professor V.P. Franklin, he teaches here, and he was teaching at Harvard on one of these renewable contracts years ago. And someone at Harvard - one of the tenured faculty members - told him, well, but you have prestige teaching at Harvard. His response was - and this is my response to my students - yeah, I can't eat prestige. YANG: You know, I have the prestige of holding a Ph.D., but that ain't paying the bills. MARTIN: We're talking about the rising number of people with advanced degrees who are relying on food stamps, and other government assistance, to get by. I'm speaking with Tony Yang. He holds a doctorate, and has used government benefits to make ends meet. He's currently unemployed. Stacey Patton is a reporter for the Chronicle of Higher Education, and she wrote about this recently. PATTON: It depends on who you ask. Certainly, many of the adjuncts would say that it is definitely a cost-cutting measure. And the universities will say well, our budgets are being cut. We would love to hire more full-time faculty, but we just can't. MARTIN: Did you have a hard time getting people to talk about this? And I guess the other question I was asking is, do people feel a sense of shame about this? PATTON: Mm-hmm. Well, I would hear graduate students and adjuncts say, well, I make so little bit of money that I actually qualify for food stamps. And so what I did was, I got in touch with many organizations such as the New Faculty Majority, Coalition of Academic Workers and other unions; and talked with their leaders and said hey, have you heard of people who are actually on government assistance? And they all said yes. The people just kept emailing me, telling me their stories. And then it was a matter of, well, who wants to go on record? And definitely, there was a lot of shame. There were a lot of people who wanted to remain anonymous because you go to graduate school, you get a master's degree, you get a Ph.D.; it's a hard thing to embrace that you're also now on welfare. MARTIN: Mm-hmm. Professor Yang, do you mind if I ask you, was it a difficult decision for you to decide to go public about your circumstances, and to be interviewed and to use your name? YANG: You know, I don't have a problem with that. It might just be my personality. It might've been, really, the fact that I grew up on food stamps and grew up poor. And I really don't have a problem with it, and I'm not particularly judgmental about it. My parents, on the other hand, are probably a little bit ashamed. I've had my mom tell me, on more than one occasion, I got the wrong Ph.D. - because mine's in history and not in computer science; because I could somehow be gainfully employed. There's this perception out there that if you have a Ph.D., you remarkably walk into a 50-, 60-, $70,000-a-year job. And that's just simply not the case. MARTIN: Well, let me just focus on something you just talked about here, which is your choice of area of study, your particular academic discipline. There were some comments - I noted, Stacey - on the site about this. There were a number of people who offered their own stories, but there were also a lot of people who were very unsympathetic, professor Yang. They kind of took the same position as your mom - which is, you're smart; why couldn't you figure out that this was going to be a soft job market? And I apologize if that sounds hurtful, but I did want to ask if that factored into your decision-making at all. YANG: To some extent, it did. I mean, that's why I'm doing economic history and not just, you know, a cultural study of the new left - not to deride those sort of studies. But it did guide it, at some level, for that. On the other hand, I think that there is a specific problem with justifying the lack of available full-time teaching positions by sort of saying, well, you know, the market dictates what the market dictates. You know, in a larger political - sort of aspect, we teach civics and how the government functions. And when you slash budgets, particularly on the humanities side, you're saying that it's not important as the engineering disciplines, or as in the biochemistry disciplines. And that has very deep effects. And something I tell my students - that the result of some of this horrible political divisiveness, or people not understanding political ideology or rhetoric, can be directly traced to the lack of under-funding, you know, these basic civics classes. MARTIN: Stacey Patton, have you found that there are certain disciplines where graduates, or people who hold these degrees, are more likely to be under-employed than others? Does it tend to be concentrated in the humanities? PATTON: From what I'm hearing, yes. I did a short survey that accompanied the piece, and took note of the top fields in which graduate degree holders were also food stamp recipients. And I believe the top were English and history and communications, or something like that. But there were people who were also in biology, and in the sciences. I saw maybe two respondents who were in the math. MARTIN: And finally, you mentioned that there's a vast gap between people who have kind of tenured positions, administrators; and people like professor Yang, who are just starting their careers. Is this seen as a problem in the academy? PATTON: Oh, definitely. Definitely. I hear all the time from, you know, adjunct advocacy groups. I hear it from the adjuncts themselves. I think graduate students are also very anxious. The level of transparency about student outcomes, and the availability of jobs and what we're training students to actually do, to meet the market demands, is starting to be a serious conversation. In terms of people with master's and Ph.D.s on government assistance - I think has come as a shock to many people. I, too, was shocked by the numbers. It's about 1 percent of master's degree holders, and 1 percent of Ph.D. degree holders, who were on government assistance. So someone might come along and say oh, that's such a small number. But what's frightening to me is that the numbers more than doubled in a three-year period. And so one has to wonder - is this trend going to continue to increase; if the government's data has actually captured a full picture of people who have these degrees, who are also in graduate school and also relying on food stamps, or are even eligible for government assistance? MARTIN: Professor Yang, I have to ask. 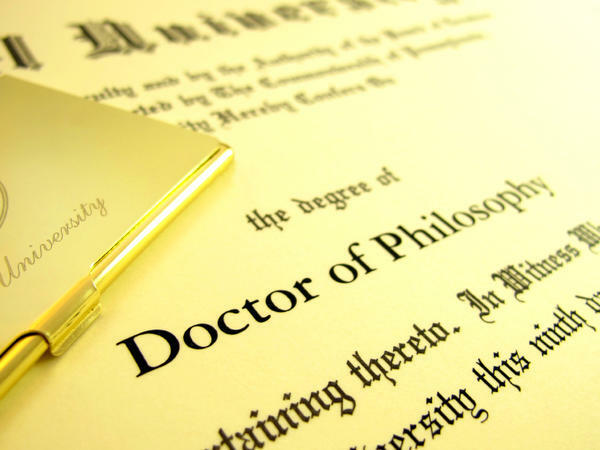 If you had to do it all over again, do you think you would still pursue your doctorate in this area, in your discipline? YANG: I would. I think it's always worth pursuing intellectual pursuits. It's always worth it to - sort of gain a better understanding of the world. And let's face it, you know, if you have a Ph.D., you're in a subset of the population. There's a tremendous amount of skill and determination to actually get that degree. I think at the end of the day, your skills will translate to something. It just might not be in our field. And that's something that's a little bit sad because we're losing a lot of potential, and a lot of expertise. But I think it certainly is worth it - at least from an intellectual standpoint - to go ahead and pursue your interests and curiosity and find out what, you know, your subject matter is all about. MARTIN: Tony Yang has a Ph.D. in history from the University of California- Riverside, and he was kind enough to join us from that campus. Stacey Patten is a staff reporter at the Chronicle of Higher Education. And she wrote about the number of people with advanced degrees and graduate students who are relying on government benefits, including food stamps, to make ends meet. And she joined us from Baltimore. YANG: Thanks, Michel. Transcript provided by NPR, Copyright NPR.